Commercial Quality Black Iron Frying Pan 10in..
Commercial Quality Teflon Coated Frying Pan 9..
Horwood Stainless Steel Frying Pan 9.5ins 18/..
Judge Frying Pan 9.5ins Teflon coated.. Wooden Handled Wok 30cm Dia.. 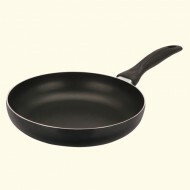 Stainless Steel Frying Pan 9.5" (with lid)..